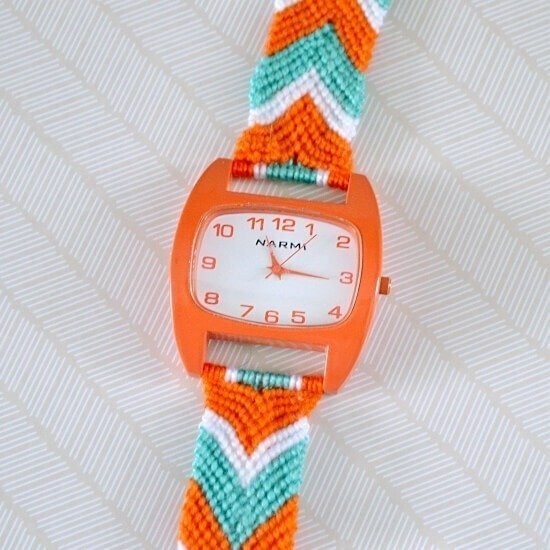 This Friendship Bracelet Watch goes after the braiding trend with gusto and style! 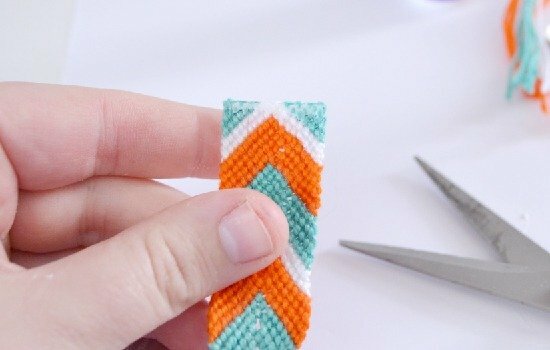 A few weeks back I made some horribly embarrassing videos to show you how to make chevron friendship bracelets. 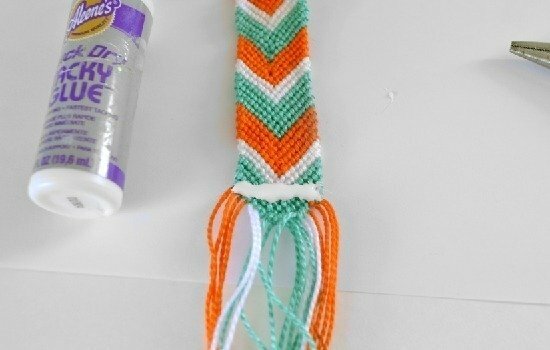 The reason why was because I had a handful of chevron friendship projects to show you. But I dropped the ball and they got lost in the shuffle. 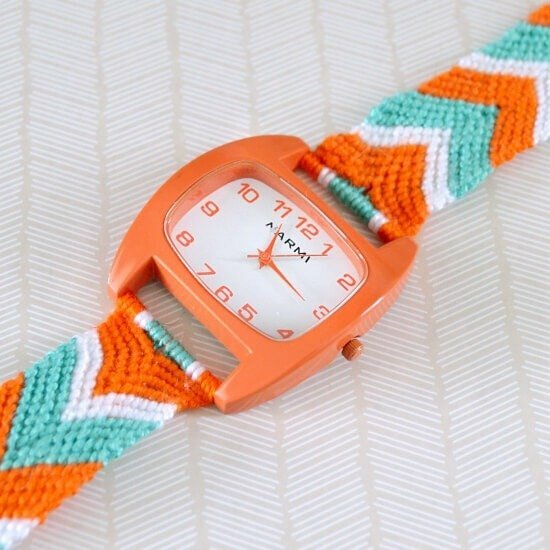 So today I’m finally sharing with you the second chevron project…a totally awesome friendship bracelet watch (the first was DIY chevron flip flop straps). 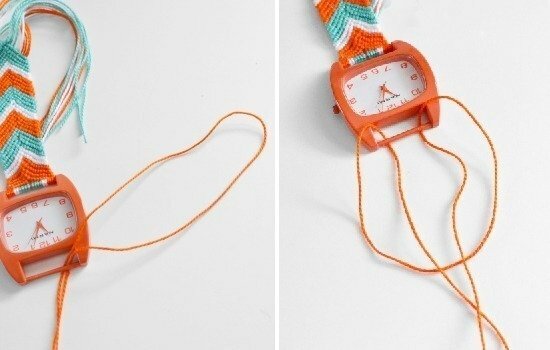 To get started you’ll need your watch face and your floss. 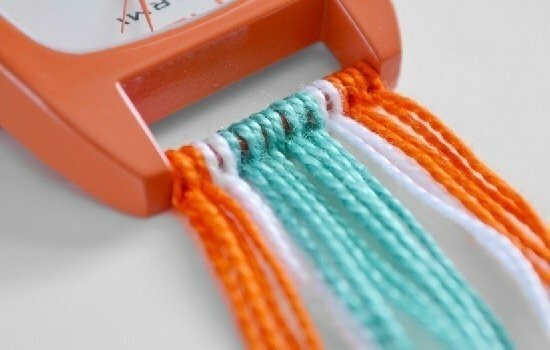 I’m using craft floss in orange, white and a minty blue type of color. Cut strips that are about 48 inches long. 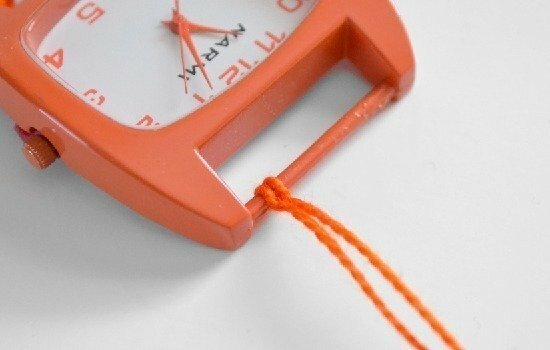 For this watch face you’ll need 10 of these long strands for each side (but only cut 10 right now, leave the others until you’re ready to start on the other side). We’re going to lash each piece of floss onto the bar to begin making our strap. Put the ends of one long piece of floss together and grab the end. Push it through the bar and then pull the ends through the loop you made just like in the pics above. Pull tight to latch on. Continue this for all of your cuts of floss. Be sure to maintain the colors as you want them in your pattern. 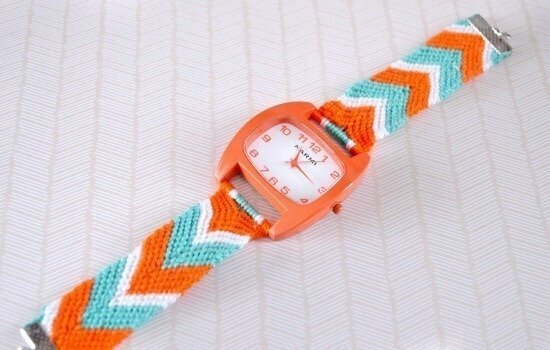 I wanted thick stripes of orange and mint and thinner strips of white. As a result my order went: orange, orange, white, mint, mint, mint, mint, white, orange, orange. And now you just start your friendship braiding. Because we latched onto the post we’re not going to have that weird bunched up thing that happens on most friendship bracelets that begin with a knot. Pretty cool, huh? 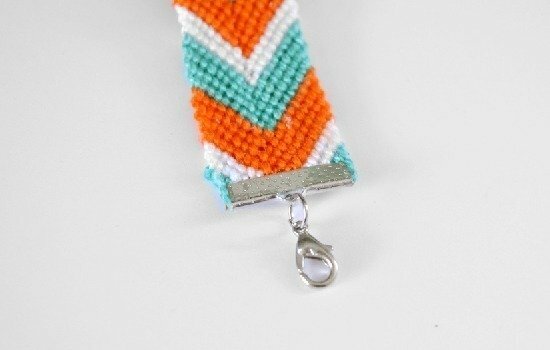 You have the option of braiding the ends like any other friendship bracelet and then tying closed when you wear it. This isn’t the prettiest option but it will work really well. But if you want to use closures, keep on reading. When you get the length you want take a decent amount of glue and run a line where you’ll need to cut. Rub the glue into the threads on both the front and back sides. This will keep the braid firmly together for our next step. I used Aleene’s quick dry tacky glue because I’m horribly impatient. One thing to note is that friendship braids have a decent amount of give in them. I didn’t consider this and after a few wears I’ve had to shorten my straps. You may want to go ahead and make the watch a weensy bit tight. It may be uncomfortable that first wear but it will be perfect a few hours in. 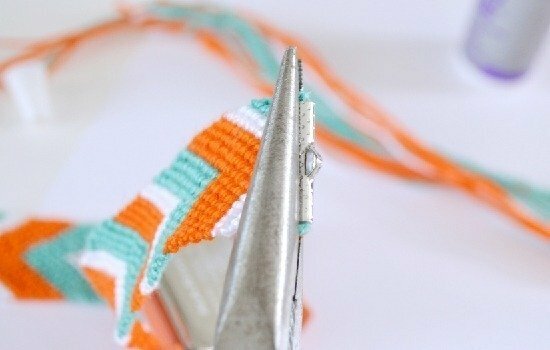 Use sharp scissors to cut through your strap in the area you applied the glue. See how well it sticks together? Go ahead and run a bit on the very end to help prevent fraying. Place your clamp onto the end of the straps and use pliers to clamp tightly on. Finish the ends with a jump ring on one anda jump ring and closure on the other. And there you have it! 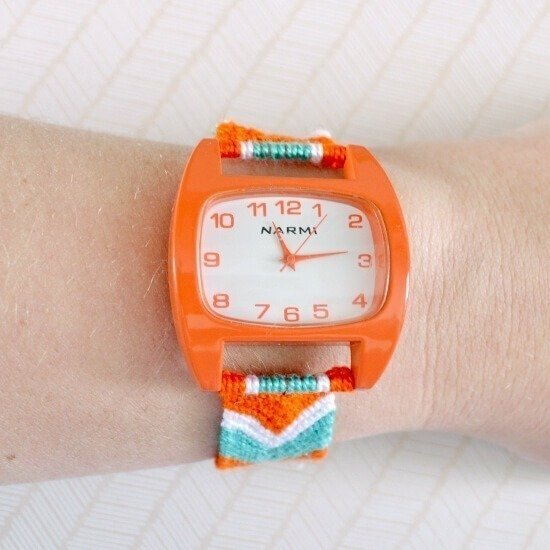 It’s a pretty fun watch to wear and brings in the whole friendship bracelet trend in a new way. What do you think? Will you be making one up? Sounds like a great weekend project to me! Happy Friday. Hoping your weekend plans are stellar! I love it!!!!! It actually looks like beads!!!! I find that your ideas of do-it-yourself are really Great! Félicitation !!! This came at about the most convenient time ever! My cheap watchband just broke and I couldn't find a new band in the same color (the color is like an aqua color leaning towards turquoise). So this idea is great! I haven't made a friendship bracelet in a while but I'm sure it will come back to me. You are so smart and clever! Genny-I agree! I too have an aqua watch face, and I had made it using two strands of aqua mother of pearl beads with a magnetic closure. It needs a battery now-so I think I will take the beads off and try this! 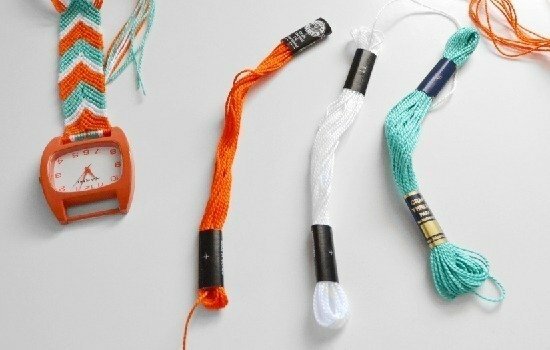 I’ve never done a friendship bracelet, but it looks like fun! What colors are you going to use? Thank you for this tutorial. I have a watch that was a special award so it is special to me. The strap broke and I have tried several replacements that have been too small – I have big wrist bones – or fabric ones that don't last. This is perfect – I can make it to fit and can replace any time. The lobster claw fastener makes it easy to put on and take off. Great project, I love it!! I am so glad, Sylvia! I have really narrow feet. Anything that makes us different can make finding common things like shoes or watch straps a nightmare. So glad i could help!! 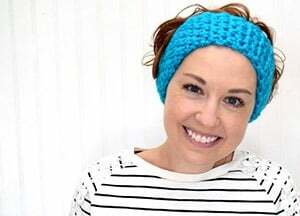 I am glad you like it S H.
This is awesome (and my favorite color combo of the moment too!)! 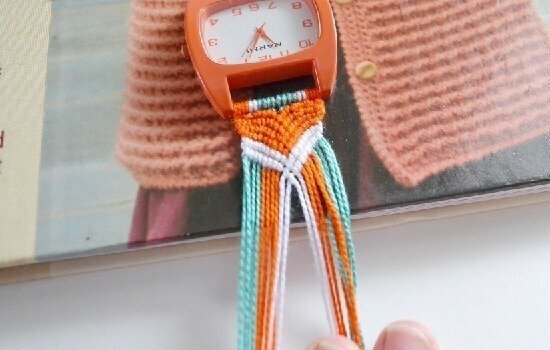 I loved friendship bracelets when I was a kid, but I always got them from my friends and rarely ever made my own. I might need to revisit the idea now that you've given me a fun grown-up version! Thanks so much, Cindy – how wonderful! I’ll be sure to link up more! Thank you for the idea. I have a flag watch that I’m always buying new bands for. This is going to make the perfect band for my watch. Been trying to find a patriotic band for years but nothing fit on the posts. Finding a band you like in the right size can be impossible. Very glad you can make your own!